Indonesia belongs to one of the most volcanic and seismically active region in the world. There are 128 active volcanoes of which 76 had eruption in historic time. These were occurred in 3 belts which one of is Lesser Sunda Islands where is located. The Indonesian Volcano logical Service classified those volcanoes as “class A” volcanoes, of which there 12 in Sumatra Island. One of those is . is located in South Lampung region in Sunda strait, between Java and Sumatera. In the early time estimated was a volcano with 2000 M in height. The catastrophic eruption destroyed the volcano and remained 3 islands i.e. Rakata, sertung and Panjang. 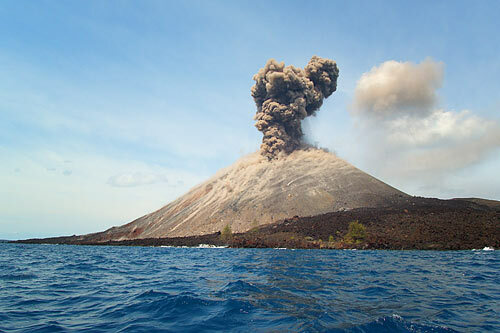 The renewed activity was started at Rakata, and an island of strato volcano was built up with diameter of approximately 5 Km and 800 M high. After its dormancy, next activity was shifted come into existence with the height approximately 456 and 120 M above sea level. In 1883, the 3 summits (Rakata, Danan & Perbuatan) was erupted and leaving a piece of small part of Rakata. The boom of explosion causing tremors and was heard as far as Singapore and Australia. The wave washed everything away around volcano. The volcanic ash was blown in to the atmosphere, as much as 4 cubic miles. In 1927 the new activity was occurred and then Anak existed in to being. Now Anak has reached 250 M above sea level. Anak still active with its gush of steam and smoke, make it spectacular view. Today we can come and step our foot on it searching closely the minerals (Volcanic bomb, lava, lapel) from the bottom of the earth which were thrown up through its crater. and its terrific eruption, which is recorded in the history, now has invites every one to come and see for science as well as for pleasure. The way to get there is from Canti located in Kalianda about an hour driving from Bandar Lampung, and the boats will take to the Karakatau area. Near by the there are Sebuku and Sabesi Island as for stopover and staying over night. It is only taken one and half-hour from Canti.